Miss Edith Jane Bacon, 92, of Zion, former North Shore Country Day teacher, died June 17 in Broad Nursing Home, Evanston. Miss Bacon taught art at North Shore Country Day from 1931 to 1947. Before coming to the area, she was on the staff of Kemper Hall Academy in Kenosha, Wis. Funeral services were held June 20 in St. Mark's Church, Evanston. 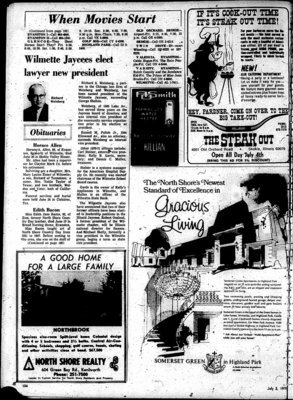 Some text in microfilm scan may be illegible and marked "damaged." Obituary notice begins on page 104 and is continued on page 106.